Many cheers, it’s the end of another week and time to reflect on being frugal. It’s been a quiet week for us, with the whole family struck by colds to a great or lesser extent. I suppose the silver lining to pottering around at home was that we didn’t spend very much! Last weekend, before the colds hit, we did all get out. 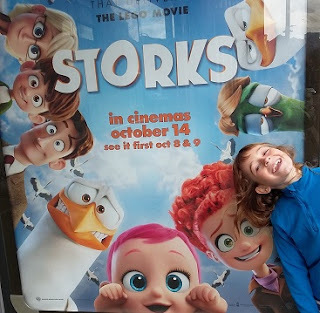 On Sunday morning, my daughter and I went to see a preview of “Storks” over at the Colchester Odeon, while my husband whisked my son off to rugby. However, I took advantage of free cinema tickets offered via my Times and Sunday Times subscription. I’ve just checked, and if we went this weekend, it would have cost £18.50 for the two of us. I booked online and had to print out the email, but then we just handed the piece of paper to the usherette at Screen 1, and could pick whichever seats we wanted. Reckon my 8-year-old daughter was pretty much the perfect audience for a film cram packed with babies, more babies, storks, comedy wolves and a mad female inventor. Her review; “So cute it was bursting with cuteness!”. With four of us flying in all directions on Sunday morning, we were unlikely to make it home much before 1.30pm. I decided to make a speedy packed lunch before we set off, to quell any hunger pangs in the back seat. 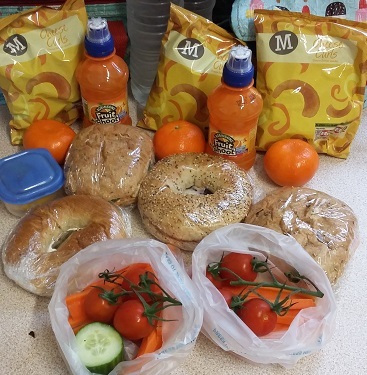 Taking packed lunches, rather than grabbing food on the go or eating out, definitely helps keep our bills in check. I resurrected some of yellow-stickered cut-price bagels from the freezer, and bunged in assorted combinations of soft cheese, ham and stilton depending on preference. I also raided multi pack crisps and drinks, chucked in cucumber, tomatoes, carrot sticks and satsumas in a nod to health, and added a little blue box of sliced peach for my satsuma-disliking daughter. If you need further inspiration, check out my post on top tips for thrifty packed lunches. Before we left on Sunday morning, I dug a half-price chicken out of the freezer. After the thrifty packed lunch, I decided to do a full-on roast meal that evening, which would also provide speedy meals later in the week. 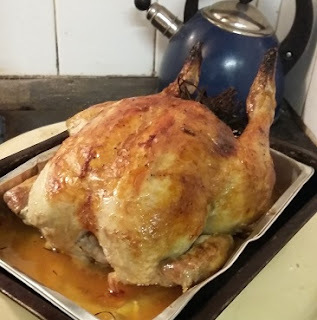 I stuffed the chicken with garlic, lemon halves and a bunch of tarragon from the garden, rubbed the skin with a bit of butter and poured some lemon juice under the skin. 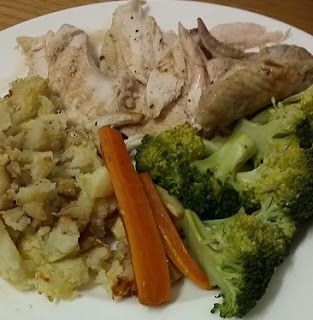 We ate part of the chicken with roast carrots, roast parsnips and my daughter’s favourite mashed potato and gravy. Afterwards I stripped the remaining meat from the bones, to be boxed up in the fridge. I then made chicken stock by boiling up the bones with a litre or so of water, a couple of bay leaves from the tree in the garden, a few black peppercorns, half an onion, and the peelings from the carrots and parsnips. It made the kitchen smell amazing, and will make a base for soup or risotto. I made sure to cook more than enough mash, to accompany a meal a couple of nights later. Once my husband had shifted his cold, I steamed some broccoli to go alongside the leftover chicken, mash, carrots, parsnips and gravy. There was even enough left to make a chicken and peanut stir fry with rice the night afterwards. All in all, the £2.45 yellow-stickered chicken provided enough protein for 6 adult meals and 2 children, and there’s still soup to come. Stretching food to make several meals helps save time as well as money. Check out previous posts on stretching roast pork and sausages too. With the first day of October on Monday, I decided to start a month-long savings challenge. I’ve been posting my small changes each day, aiming to spend less, earn more and save a chunk of cash towards Christmas. As of Day 6, the running total for these small changes was £40.75, after my husband and I both got given some £2 coins in change. For Days 6 and 7 I’m going to dust down the direct debits on our current account, to check if there’s anything unwanted that needs cancelling, and catch up on my spending diary. I wish I could pretend this was a fifth frugal thing about wholesome crafty activities with the kids. But no, I wanted to celebrate the small success of reaching 250 followers on Instagram, as I track the passing of the seasons in our garden by posting a different flower each day. 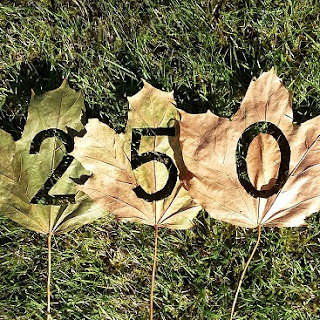 Trudging home from the school run, I was inspired by the idea of taking a photo of leaves with the numbers cut out. After battling with templates, an uneven lawn and the joys of the autumn breeze keen to whip away dry foliage, I can safely say this wasn’t my best plan. Do come and follow me over on Instagram, but feel free to remind me that taking nail scissors to leaves is an insane idea, should I ever contemplate it again. But, on the plus side, it was at least free! For those of you on the edge of your seats, after three weeks the 49p basil plant still lives! 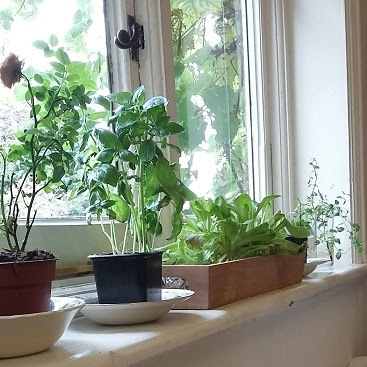 As you’ll see from the pic at the top of this post, the kitchen window sill is going great guns with the basil, the accidental hydroponic mint, the remains of some coriander and a miniature rose which I’m hoping to resurrect. In the middle you can also see the 25p pot of living salad, bought this week as part of the yellow-stickered shop on Day 5 of my savings challenge. Any bets on what survives till next weekend? Anyone else have any frugal triumphs or crafty disasters to report this week? I’d love to hear! I love your October savings challenge. 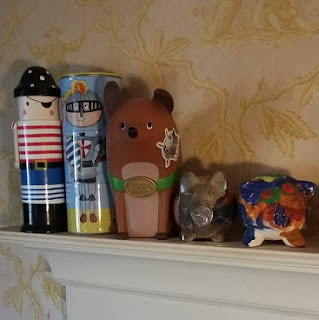 We collect coins as well, but do raid it for things like preschool snack money or kiddies birthday pressies;-) I paid £80 into bank account 2 weeks ago. Thanks Lynn! Yes it's always tempting to raid moneyboxes for spare cash. Reckon your approach of paying it into a bank account definitely helps hang onto any savings!